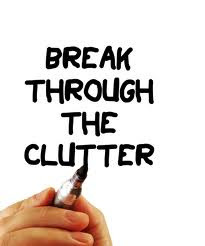 Carole's Chatter Blog Tips: Do you need to declutter your home page? Fairly soon after I started blogging I realised that my home page was getting very long because of the list of Blogs I Follow - which is one of the standard Blogger gadgets. It is nice, of course, to give recognition to the blogs you follow but when there gets to be a long list I think it loses its effectiveness and just becomes a source of clutter. What I did was instead of having a full list, I created several different short sidebars. One lists the Food Blogs that I am featuring that month. The others list featured 4 Book Blogs and 6 Personal Blogs - those I refresh only every 2 months or so. All you then have to do is remember to choose the blogs to add/remove each time you review your lists. Delete your Blogs I Follow gadget (if you have one0 - you can always put it back later if you want to. To delete this you need to be on the Layout section of your dashboard. Click add a gadget. Don't worry where it is at this stage because once you have created it you can always drag it to where you want it and drop it there. Then select Blog List - give it a suitable title, choose whether to sort it by last updated or alpha (I chose alpha because that's the sort of train spotter I am). Leave it at showing all blogs - since you will only be adding a few. And lastly choose how to display the blogs I chose Icon and title of most recent item only. You could choose a bigger display but I like to keep things as simple and uncluttered as possible. Then you have to add the blogs you want in the list - you can either add by copying and pasting their url's in or you can click from your blog list and choose from there. Finally, don't forget to click the orange save button right at the bottom of the gadget window otherwise all of your hard work will have been for nothing! You can do sidebars for lists of your own posts a similar way but you use the Link List gadget instead of the Blog List one. Following you by email from the blog hop! If you have a moment to stop by my blog that would be great. Can't wait to read more of your blogging tips! There's not much more that drives me crazy that cluttered up sidebars! Seriously, I think my blood pressure raises 20 points for every widget present lol. I finally created a whole page dedicated to the blogs I follow...but I'm not sure what happened to it. Huh, I'll have to look into that! I am a new follower from the GFC blog hop!